ePublishing Knowledge BaseePublishing Knowledge BaseePublishing Knowledge Base EditorialHow do I find and edit an existing author? This article will show you how to modify an existing author's details on your website, including their name, email address, Twitter handle and bio. As background, when you create or edit an article or blog post, you may select an author to be associated with that content. Zoom: As background, when you create or edit an article or blog post, you may select an author to be associated with that content. This is the name that will appear in the byline and whose bio will appear under or beside the article, depending on your website's design. By associating content with authors, you may present content by author on the website. And include the author's bio, if you choose, at the top or bottom of an article or blog post. 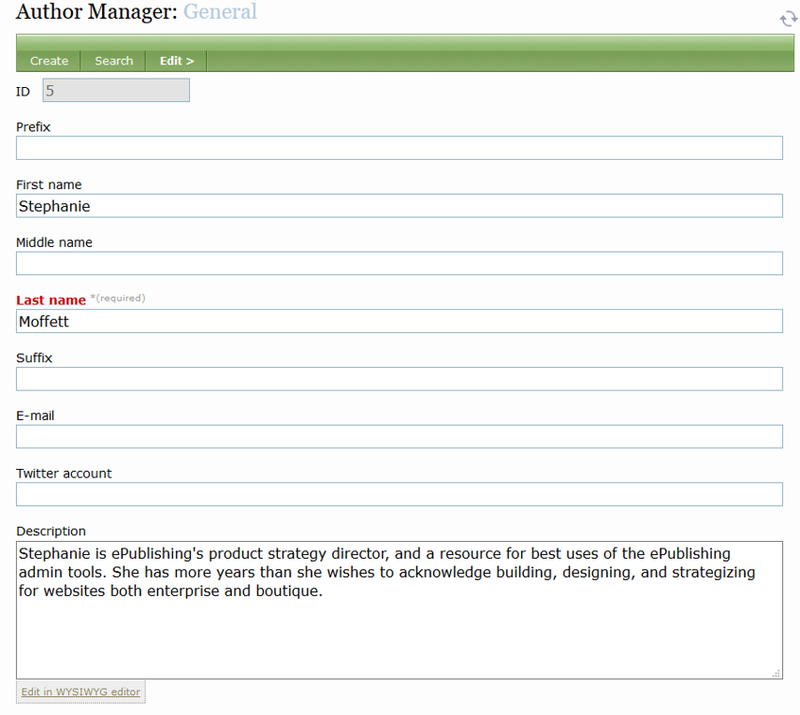 Access the Author Manager under Editorial. Select Search & Edit. Click the name of the author you'd like to edit. Zoom: Click the name of the author you'd like to edit. This will open the author's record in the Author Manager. Zoom: This will open the author's record in the Author Manager. To change an author's name, edit the First Name and Last Name fields. Zoom: To change an author's name, edit the First Name and Last Name fields. To change the Twitter handle of an author, edit the Twitter field. Zoom: To change the Twitter handle of an author, edit the Twitter field. To change the email associated with an author, edit the E-mail field. 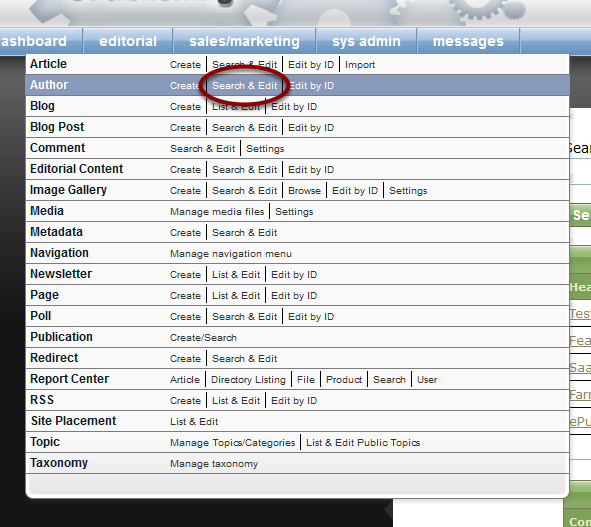 Zoom: To change the email associated with an author, edit the E-mail field. To update the bio of an author, edit the Description. Zoom: To update the bio of an author, edit the Description. To edit the image associated with an author, click Browse under Image and select an image from the Media Manager. 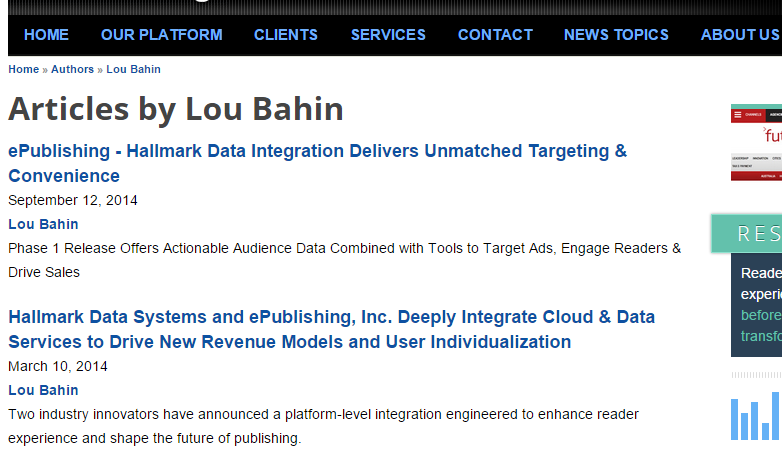 Zoom: To edit the image associated with an author, click Browse under Image and select an image from the Media Manager. Need more information on using the Media Manager? Read this article: How do I upload new media, such as photos, videos and files? When you are finished editing the author, click Save. A yellow bar will appear when the changes to the author have been saved to the database. 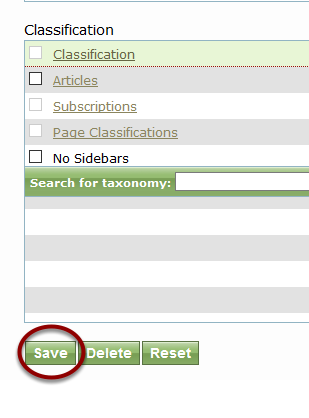 Zoom: A yellow bar will appear when the changes to the author have been saved to the database. To delete an author, click Delete at the bottom of an author's record. Zoom: To delete an author, click Delete at the bottom of an author's record. Prev: How do I manage comments? Next: How do I create a new author?